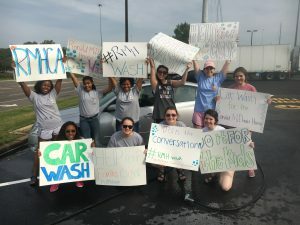 Ronald McDonald House Charities of Alabama’s Student Leadership Council held a Car Wash in April to help raise money and awareness for the House. They were able to raise over $265 and they had some fun while doing it! This group of high school juniors and seniors from high schools all over the area came together and worked hard all day. Using the McDonald’s restaurant across from the Galleria on Highway 31 as the location, they ran a successful car wash and were able to connect with McDonald’s customers and folks who were just driving by. Ronald even made a special appearance! We will be sad to see most of this group graduate and go off to college, but we are so proud to have been a part of their volunteer experience during their time with us. If you or someone you know is interested in the Student Leadership Council, please learn more about it and see if it would be a good fit!